Just read on Ricky’s blog that Konfabulator has been bought by Yahoo and is now free. Yippee. Yahoo even. This should give the desktop widget market a good kick. 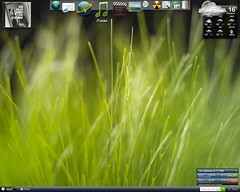 DesktopX has been around for a while but is still too awkward to use and configure. Same for Samurize although you could get some stunning results if you put in the effort. Konfabulator was always nice but cost money and was short of widgets the last time I tried – not any more. I’ve put up my new desktop which has also taken on a Longhorn Vista look and feel to celebrate the fact we’re a year away from a new Windows environment. So much was promised with Longhorn and on the face of it so much has been stripped out. Here’s hoping there will be a radical yet stable product at the end of it all. When was the last time you used DesktopX? Its widgets are easier to use than Konfabulator, they’re EXEs. How much easier can you get than that? I know they are exe’s but I can never find widgets that suit me – I’ve found them easily with Konfabulator. Maybe me & DesktopX just don’t get on. Now all they need to do is stop Konfabulator sucking up memory like a demon and I might consider using it! It takes up quite a bit – no more than Firefox though. Won’t mention Outlook – memory whore!